Week 8 of BBL08 saw this year’s semi-finalists confirmed, as a Glenn Maxwell special saw the Stars cement a record-equalling seventh finals berth. We said before the season kicked off that both Glenn Maxwell and Marcus Stoinis would determine the Stars’ fate in BBL08. And so it’s proved to be the case, in stark fashion. 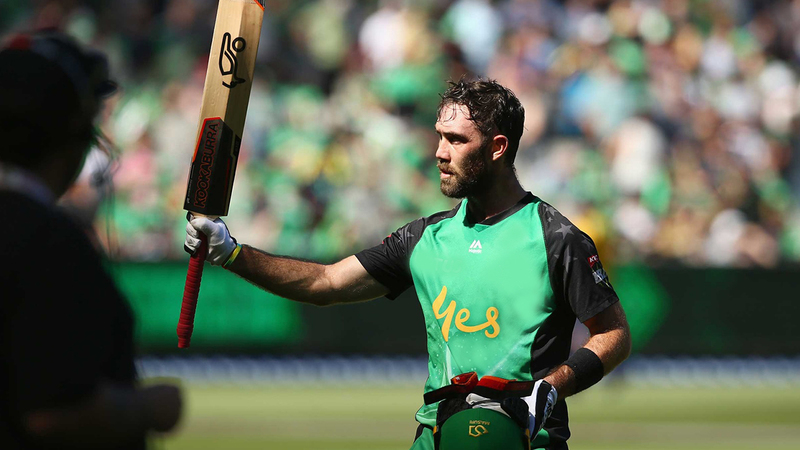 Maxwell took the MCG by storm on Sunday, plundering 82 off 43 against the Sydney Sixers to take the Stars to a match-winning total. At 3/91 after 15 overs, the Green Machine were on the precipice of an underwhelming first-innings total in a must-win game. The Stars needed just one win from their last two games, and after a dismantling at the hands of the Heat on Friday night, a loss to the Sixers would spell curtains for a season that had promised so much. Enter Maxwell, who almost single-handedly plundered the Stars’ 77 runs from the last five overs. This had never been done before in BBL history. As it turned out, the total proved far too much as the Stars routed the Sixers by a whopping 94-runs. The win moved them into equal second-favourite for the BBL title at $3.75 with Palmerbet, and travel to Hobart for a Thursday blockbuster against the table-topping Hurricanes. The Stars now share their $3.75 price with cross-town rivals the Melbourne Renegades. Incidentally, Maxwell’s best mate Aaron Finch – the ‘Gades skipper – has his mate to thank for Sunday’s result. It ensures their Friday night semi-final stays in Melbourne. They start the clash as $1.80 favourites against the Sixers. As it has been for much of the season, the Hobart Hurricanes remain as BBL08 favourites at $3. They’re also fancied to knock off the Stars on Thursday, currently at $1.74 (Stars $2.10). Having finished the regular season two games clear, it’s hard to argue that the ‘Canes don’t deserve a spot in the final. But ‘deserving’ doesn’t come into the equation with T20 cricket. If Maxwell and Stoinis fire again on the Apple Isle, it could spell an early exit. Two men who have dominated the BBL08 run tallies are Hurricanes openers D’Arcy Short and Matthew Wade. Short has scored whopping 602 runs, with Wade just behind on 590 runs. In Palmerbet’s ‘top tournament runscorer’ market, Short is still a $1.45 favourite. But if you fancy Wade to overtake his teammate in the next game (or two, should they make the final), you can get $2.50.